Real-time Data on the SDGs: What Will it Take? TReNDS and the Global Partnership on Sustainable Development Data preview an ambitious new program in support of real-time data on the Sustainable Development Goals. Measuring progress is key to achieving the Sustainable Development Goals (SDGs), but too much of our data is out-of-date, and too many people are missing from the numbers. The Global Partnership for Sustainable Development Data, TReNDS are previewing an ambitious new program for applying the best knowledge, data, and innovation to understanding SDG progress for all. Our aim is to make sure governments, businesses, and civil society organizations can track progress and identify who is being left behind, so they can optimize policy decisions to achieve the Global Goals by 2030. 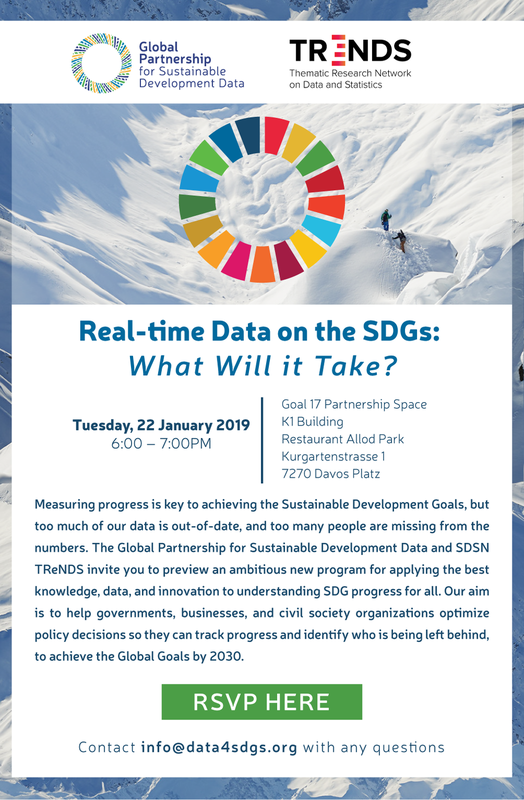 RSVP for the event here and for more information, contact info@data4sdgs.org.